"Sampath Speaking" - the thoughts of an Insurer from Thiruvallikkeni: human trial of 'super bananas' soon to come .... vitamin A rich ones at that !! human trial of 'super bananas' soon to come .... vitamin A rich ones at that !! – varieties of banana, that delicious fruit. Recently, there was an article which explained at length that youngsters see it as ‘elderly people’s fruit’ and do not consume much … while old people feel that they need to eat one at least every day. Then there is the ‘green banana’ – in one way green is unripe …having starchy texture and inedible – but green banana is a variety – generally big in size …… modern technology is supplying that yellow banana in green (confusing !) – yellow ones are generally smaller – but recently big yellow bananas – similar to the size of green ones are flooding market, coming reportedly from Bangalore. Banana, that delicious fruit is the common name for herbaceous plants of the genus Musa ~ interestingly, bananas do not grow from a seed but from a bulb or rizhome. Once the alluvial belt alongside the river Kaveri in Thanjavur, Trichy, Thiruvaiyaru flourished with banana plantation – now with water not fully flowing – understand that the cultivation too has suffered. Down south in India, eating in a banana leaf is fulfilling and traditionally food is served on big banana leaf on ceremonial occasions. Though India is one of the major cultivators and ranks high in terms of produce, We unfortunately are not on top when it comes to trade, especially export trade. Though not much from India, the banana export has a good market especially from Mexico, Ecuador, Costa Rica, Philippines and Colombia. The prospective buyers are US and Europe. Banana continues to be the most common fruit – and most sought after too. Every summer – mangoes of various hues comes – and alongside fears of chemicals being used to artificially ripen the juicy mango dents the asirations. Few know that Morris, a banana variety popular in Chennai, is artificially ripened, but in a safe way. The technology was developed by the Trichy-based National Research Centre for Banana in 2006 and is a rage among banana growers according to its director. The chemical-induced artificial ripening of mangoes using calcium carbide has triggered a major controversy and caused apprehension among lovers of the fruit. In contrast, the artificially ripened Morris variety is good for health and does not cause any harm, says its spokesperson. In a bid to allay apprehension, the Food Safety and Standards Authority of India (FSSAI) had, in the year 2010, clarified that the use of ethylene gas to ripen the fruit was safe. This variety is rich in potassium, calcium, magnesium phosphorus and iron and is also a source of Vitamin A and C.
While the outside of the 'super bananas' will look just like any other banana, the inside will be different. 'The banana flesh of a pro-vitamin A enriched banana is orange rather than the cream colour we are used to and in fact the greater the pro-vitamin A content the more orange the banana flesh becomes,' lead researcher Professor Dale said. 'We are aiming to increase the level of pro-vitamin A to a minimum level of 20 micrograms per gram dry weight in order to significantly improve the health status of African banana consumers.' Vitamin A is typically found in cheese, eggs and yoghurt. Deficiency of the vitamin is common in poorer countries where access to these foods is limited. Poorer countries also have higher levels of disease, which can be a drain on a body's vitamin A reserves. Symptoms include night blindness and the deficiency can make people more susceptible to other illnesses. It is what is known as a biofortification project, which is the process of improving the nutritional value of crops by selective, or genetic engineering. So it could be time for scientific harvesting within the next three years of an elite line of banana plants in multi-location field trials in Uganda. Legislation to enable genetically modified crops to be commercialised in Uganda is currently in committee stage within the Ugandan parliament. 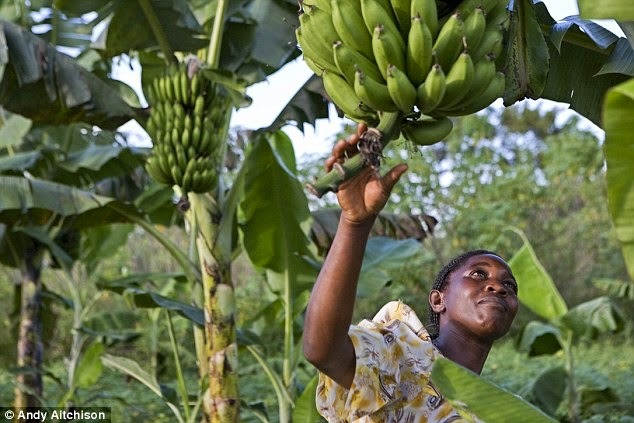 It is claimed that good science can make a massive difference by enriching staple crops such as Ugandan bananas with pro-vitamin A and providing poor and subsistence-farming populations with nutritionally rewarding food. …………. Lot remains to be tested, seen and proved.